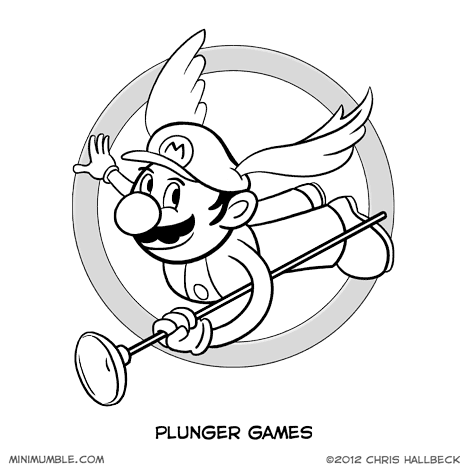 Plumbing would be a much more glamorous job if the power of flight was involved. Great way to get around high gas prices. Might not be very practical in the rain though. Best to travel by warp pipe in those situations. Pac-Man: the real Hunger Game. Shoots the apple out of the pigs mouth, that reaction almost made up for the fact that they changed his character so freaking much. I would read this book immediately. This story probably wouldn’t have a kid with his name spelt wrong. Seriously, Peeta? His parents had to have forgotten the “r”. But I guess Catnip (Katniss or something?) is a pretty bad name too. Actually, the name Peeta is a play on words. His father is a baker, and Peeta is a kind of bread. So the spelling there was totally intentional. Same with Katniss – it’s a type of plant.